I love this. Do you want something that's funny? Lyrical? Haunting? Just by asking what you're in the mood for, NoveList has changed the game entirely. Just this simple line: "I'm in the mood for..." has turned this database from something strictly for information professionals, to a user-friendly wealth of information. Go ahead; you've been invited to click around and decide what kind of entertainment can be tailored specifically to suit how you're feeling. You can choose from some of the database's pre-mixed appeal terms, or you can mix and match your own with their appeal mixer. Please note that you can also specify the age range of the books you're searching for; this is great for older kids or their parents. Please note that, yes, recommended appeal terms change when you change the age. While it is technically possible for there to be sweeping and dramatic books for kids, it's more likely that they will be in the mood for "silly and whimsical." You can choose from several categories: character, illustration, pace, story line, tone, and writing style. Each category has its own appeal terms; the numbers in parentheses indicate how many items are listed as having that trait. When you choose two or more appeal terms, the database will search and find books that have both traits, which you can browse through or view as a page. Very occasionally, you might run across a combination that doesn't find any results, and you will get a note that nothing was found. While Danielle did show me this when showing me around all the new features, I should note that it actually took me several tries to get the note up on my own. There are just that many books in this database! If you do encounter this, the easiest thing to do is probably to choose a similar appeal term that has more titles attached to it, and try again. Yes, you could browse by genre before, but now it's even easier! On the main NoveList page, you can click on the age of the reader (adult, teen, kids 9-12, kids 0-8), and be sent to a page specific to that group. Here, we clicked on "Adult," and it brought us to what's new and popular in various genres. When you click to"explore" a genre it will bring you to a whole new page about that genre, with sub-categories. For example, Forthcoming Fantasy and Contemporary Fantasy. Each sub-genre will have a quick description of the books you can find. I really like how visual this is; I know they say you can't judge a book by its cover, but sometimes you see a cover and just know you want to read the book! On the right side of the genre page, you'll also find a handy list of genre-friendly links, including lists of recommended titles, a link to the "Keeping Up" section of the database, and articles to help with readers' advisory. 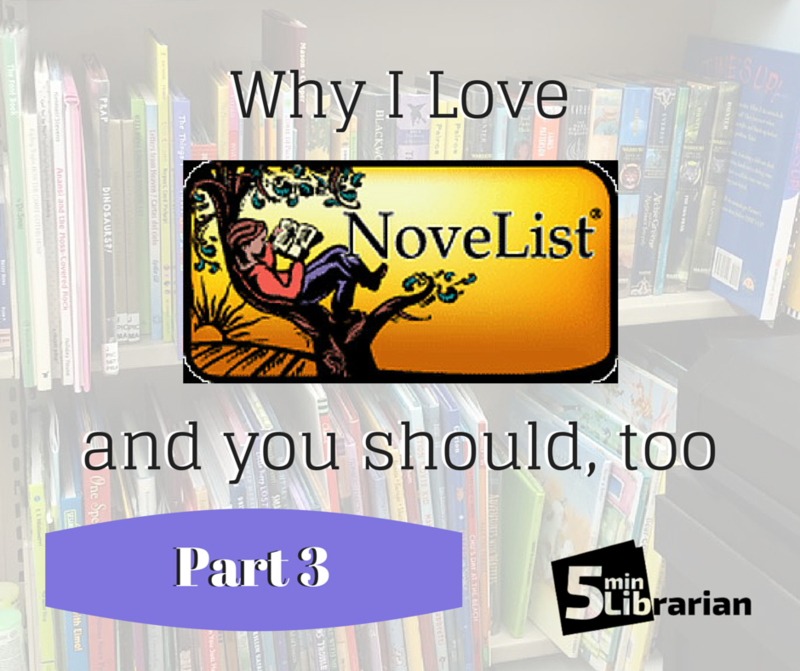 As before, NoveList has lists of read-alikes for your enjoyment. The main difference is that it's now much more visual. Instead of one book cover and a list of names, now you get several book covers. It's much more visually appealing. Back on the landing page again, there is a link toward the bottom of the page that highlights a recent award-winning book. The award will be explained, and link to the winning book. If you click on "Browse Awards..."
...you get to another page, which highlights recent award winning titles, and lists popular awards in different categories. Again, clicking the link to a specific award will give you information about that award, and a list of every single book that has won it, by year. Fabulous. On the left side of the page, you'll also see a list of genres; from there, you can find out all the different awards that are given for any genre in which you are interested. Each of these headings includes many different awards, and information about them. I really hope you've enjoyed our tour through the NoveList kingdom. 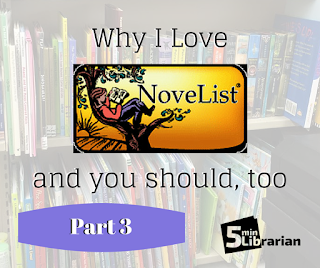 If there are any questions you have, I can do my best to answer, or you can, of course, use the FAQ available on the NoveList database, or watch any of their how-to videos. As you can probably tell, this is my favorite database. Do you have one?